Crostata: year-round dinner party go-to. When I plan a dinner with guests, I include at least one dish that I have made several times and one that is experimental so I can gather reviews. But once we get to dessert, there is no surprise: a couple of flavors of homemade ice cream and a crostata. Crostata is popular throughout Italy; you can see various types of the tart in the window of bakeries and pastry shops, and it is easily made at home. I have yet to meet an Italian who doesn't have a soft spot for one kind or another. Crostata has a place of honor in my dessert repertoire because I can make it any time of year with fruit preserves or pastry cream, alone or with fresh fruit. The shell is made of pasta frolla (or pastafrolla), a dough of flour, sugar, butter and eggs. Pasta frolla is versatile: Besides providing the base to make crostata, it makes very nice cookies called frollini. There are many recipes for pasta frolla. I have two versions that I have been using (and tinkering with) for some time, inspired by those in the seminal 1891 cookbook La Scienza in Cucina e l'Arte di Mangiare Bene by Pellegrino Artusi. It is available in English as Science in the Kitchen and the Art of Eating Well. During the summer, I use strawberries or peaches. Now I turn to pears. In recent years, I have developed a fondness for Asian pears. They look charming with their distinctive, portly shape, exuding authority and the worldly wisdom of someone who has traveled from afar. The two most widely available varieties of Asian pears are Shinko, medium to large in size with a bronze-russet skin, and Nijisseiki (aka 20th century), medium-sized and yellow-skinned. Asian pears are great as a snack, sliced and paired with cheese, diced and added to a salad. I also oven-bake sliced Asian pears and then add them to various dishes from soup to frittata, from the stuffing for acorn squash to cooked flaked rye (my husband's favorite breakfast). The crostata is best eaten the same day it is prepared. Serves 10-12. In a food processor fitted with a steel blade, pulse the sugar, flours and salt a few times to mix. Add butter and pulse several times for 3 seconds until it resembles coarse meal. Empty the mix onto your work surface in a mound. Make a well in the center of the mixture and pour the egg and zest into it. Use a fork to incorporate the liquid into the solid ingredients, then use your fingers. Knead the dough lightly just until it comes together in a ball. Flour your hands with all-purpose flour as needed to prevent excessive sticking. Shape the dough into a flat 1-inch-thick disk and wrap in plastic wrap. Refrigerate the dough for at least two hours or overnight. 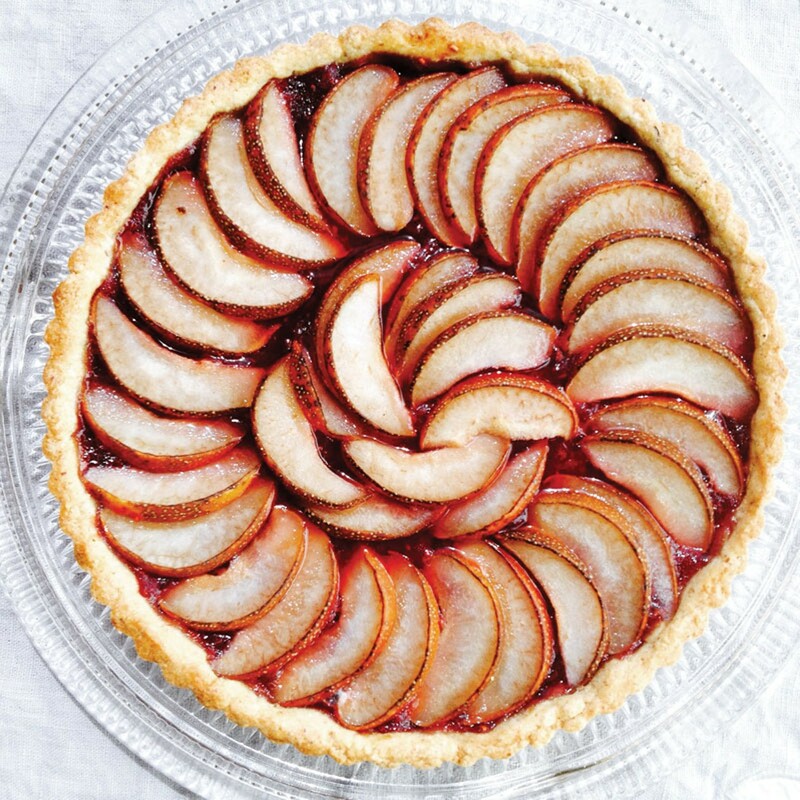 Use a fluted, round 9- to 9 ½-inch tart pan with a removable bottom. Lightly dust with flour the top of the pasta frolla and your rolling surface — parchment paper or the plastic film in which it was wrapped works well. If it's very firm, start by pressing it with the rolling pin, inching from the middle outward; turn the dough 90 degrees and repeat. When it softens, start rolling gently. Roll into a circle about 1/8 inch thick. If you used parchment paper or plastic wrap as rolling surface, flip the pasta frolla over the tart pan, centering it. Gently press it into the pan, covering all corners. Peel away the wrap. Prick the shell with a fork in several places. Refrigerate for 15 minutes, then heat the oven to 350 F.
Rinse quarter and core the pears, then slice them ¼ inch thick. Take the shell out of the refrigerator and use a spatula to make an even layer of preserves on it. 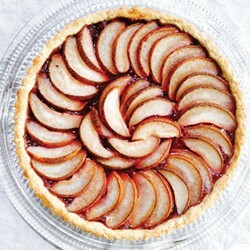 Arrange the pear slices in circles on top of the preserves, starting from the outside until you reach the center. Bake for 40-45 minutes. It is ready when the edges are golden. Remove the crostata from the oven and let it cool slightly on a rack. If you have used a tart pan with a removable bottom, release the base from the fluted ring. Let it cool a bit longer on the rack, then use a wide spatula to slide the crostata onto a serving plate to cool completely.